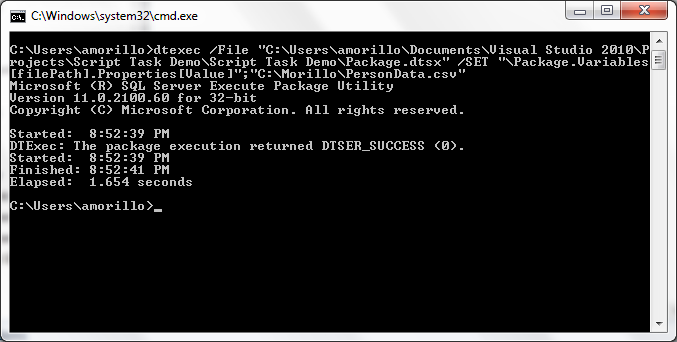 Running SSIS packages from the Command Prompt. If you would like to run a SSIS package from Windows Schedule Task, from the Command Prompt or from a batch file, you can use the DTEXEC utility as shown in the image below. We are using the /File parameter of the DTEXEC utility to specify the path and name of a package stored in the file system that we want to run. Additionally, we are using the /SET parameter to override the value of a variable (filePath) used by the SSIS package we want to run with DTEXEC. For more information about DTEXEC, its possible uses and all the parameters that it has available please click here.